How well do your students listen? Can they distill main idea or make inferences? 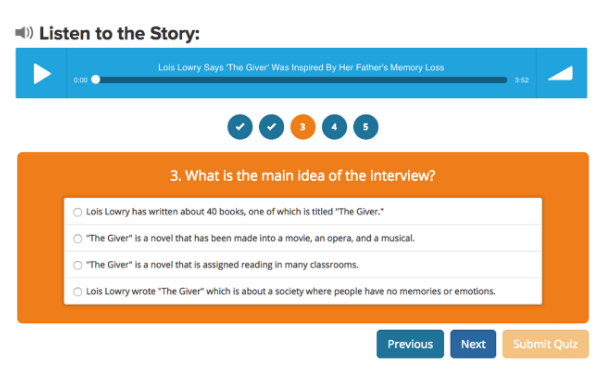 We are excited to announce that we’ve added multiple choice listening assessments to Listenwise Premium. Teachers now have the ability to assess and track 8 different student listening skills! There is no doubt, listening skills have a major impact on children’s career and college readiness, and we are excited to provide new ways to help teachers support student success. Try it now! Test your own listening or try it (for free) with your students! We have seen that there are very few curriculum products that address listening skills in middle and high school, which is what inspired us to launch some huge changes to our Premium package today. Read Monica’s Blog in Middleweb: How Do We Assess Student Listening Skills? Find out more about our listening assessments on our website. If you have our Premium version you can access the quizzes right away, and if you don’t have Premium access and want to learn more, contact us here or call us 617-855-8053.